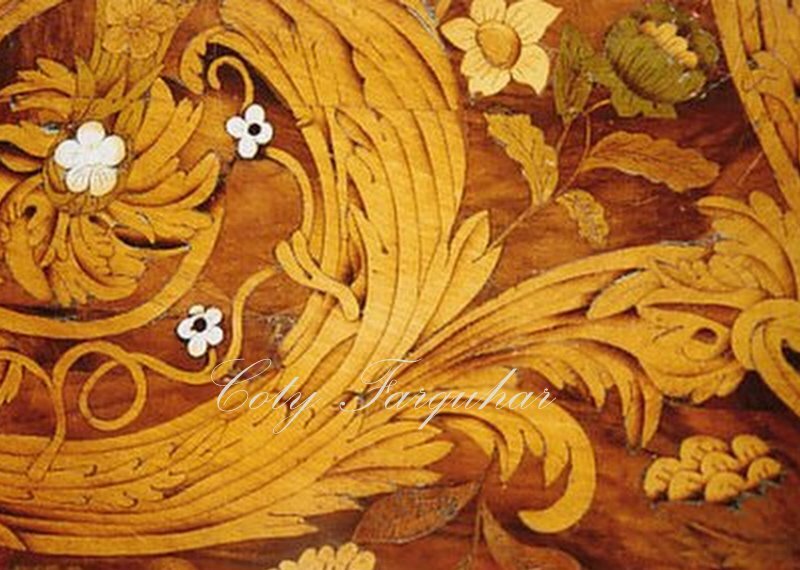 A very beautiful marquetry table was in our workshop for restoration recently and I just couldn't resist sharing this amazing and incredible work with you. The table top was completely covered with inlaid birds & flowers. It would have taken hundreds and hundreds of hours to create. 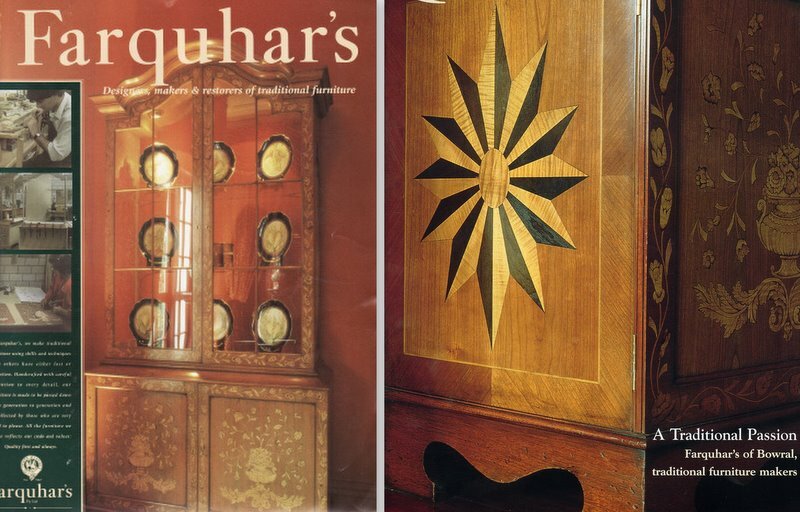 I know, because Andrew has created many cabinets with marquetry inlay with similar detailed work to this table and they took thousands of hours to make, for example our display cabinet below which is one a pair made by my Andrew about twenty years ago. 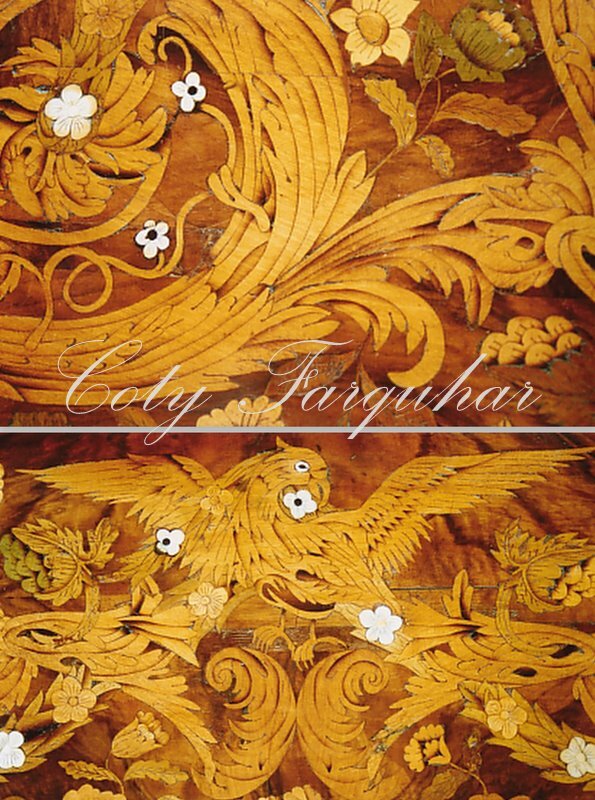 The inlay almost covered the entire cabinets, around the doors, the front and sides. I know Andrew loved creating this pair and if I could I would love to one day buy them back for him, unfortunately I don't think that will ever happen as I doubt they would ever sell them as we know our client's love them so and also I just wouldn't ever be able to afford to buy them back as they would be worth a small fortune today. Just look at the tulip flower above left and the fine detail of the birds, the leaves and the little butterflies. The depth of colour and shades are amazing, which are created by burning the edges of the cut wood by dipping it into a pot of hot sand. I love watching inlay work in progress in our workshop at Andrew's bench and I especially love the pieces before they're polished, the colours of the natural wood is beautiful. I know the woodwork is incredible, but what about the actual design, what a wonderful mind some people have to create such beauty. Just imagine what these sketches were like when they were drawn up in an old workshop many, many years ago. Boy, I hope someone still has them today, what a treasure to own. Oh my these are stunning pieces. I am with you and wondering about the creative minds whose designs these are. Beautiful. Andrew's work is just amazing.. such gorgeous detail.. he is a true craftsman.. 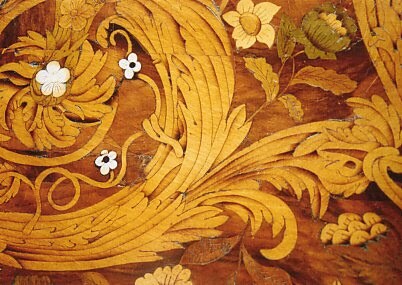 I have some of my grandmother's furniture which has inlay work.. which i love.. but nothing as detailed as this..